The deaths by the attack of big Cats at District Pilibhit in the month of August raised the death toll to seventeen in last eight months: Reflections of the negligence from authorities and evidence of man versus wild conflict due to habitat loss. Introduction: Pilibhit, a northeastern district of Rohilkhand division, Uttarpradesh, India was declared as a Tiger reserve area in September 2008. The forest area spread over one thousand square kilometers with a buffer zone of six twenty-seven square kilometer passes through Pilibhit, Kishenpur Sanctuary and Kuthar range of Shahjanpur District. The eight hundred square kilometers of the forest area of the tiger reserve in District Pilibhit is separated by Sarda River on its eastern flank from the neighboring country of Nepal. 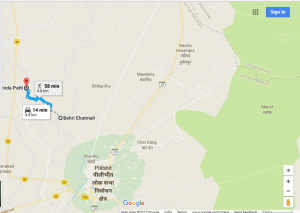 Google map image depicting the location of Pilibhit Tiger reserve. The Sarda River from a natural barrier for the Pilibhit Tiger reserve from the adjoining terrain of Nepal. The Pilibhit Tiger reserve was established with the intent to decrease the pressure on existing Dhudhwa tiger reserve of Lakhimpur District. By 2016, the reserve was home for forty tigers as an ideal habitat for big cats. With the increasing population of big Cats, the residents of buffer zone villages became victimised by attacks of the tiger. In February 2017, the forest official performed an operation to catch a tiger that has been reportedly killed more than six human souls. According to the local newspaper, more than seventeen human beings fell prey to big Cats in last eight months. The latest havoc started from 30th July when a Tiger was spotted in civil lines area of the city. The official spotted the tiger but unable to catch and it passes behind the Saint Aloysius College and entered in the countryside. One of the forest officials was injured in an attack of tiger while he was installing a camera on the reported site. In these ten days, the total five tigers were captured by the cameras of forest department in an agriculture belt of Ameria block, the area around twenty kilometers away from Tiger reserve. Series of Mutilating attacks: At 3.00 pm on 07 August, Mohammad Tasleem resident of Village Daang of Amaria Tahsil in District Pilibhit was attacked and killed brutally by a tiger while he was working in a paddy field in Village Adauli of same Ameria block. An uproar was created by the inhabitants of Amaria Block. The administration tried to catch the animal but their primitive technique again led to the failure. On next day, 08 August, Shamsur Rahman, a thirty-five years farmer of Village Sarainda Patti went to paddy fields for clearing wild grass grown up in the rainy season. When he did not return by 4.30 pm, the family members went to paddy for his search. The villager found the tiger eating the body of the victim in the nearby sugarcane plantation. On making loud noises in a group, the villagers were able to recover the half-mutilated body of the victim from the sharp canine of the carnivore of the cat family. A wave of fear spread in all villages of Amaria Block. The village Sarainda Patti is a thickly populated and located around three km from bustling national highway 74. On 10th August 2017, it was around 11.00 am when I was driving through the Village Sarainda Patti to meet a friend residing in nearby village Madhopur, the news was received on what app of one more killing at by big Cat in Village Behri that is located 5 Kilometres southeast of Sarainda Patti. The victim Kunwar Sen aged 45 was coming home from fields when he was attacked from behind. The passerby villagers tried to rescue him from the gigantic jaws of the carnivore but failed to save the life of the victim. The efforts of villagers saved the mutilation of the dead body of Kunwar Sen by the tiger. On reaching Madhopur, the family members of the friend provided further details and confirmation of the Kunwar Sen death.This was the third death by tigers in four consecutive days. The people of the outskirts of the city such as Civil lines where the tiger was spotted multiple times on 30th July along with the villages of District Pilibhit got threatened by these attacks. According to forest officials, a tigress relocated from the reserve to Duni Dam in 2012 AD with three cubs. Duni Dam is a barrage on Deva River with shrubs and man-made plantation on an area of hundred hectares around the river. From last four years, the officials were aware of the new habitation of tigers in thickly populated Ameria block, a site around eighteen kilometers away from buffer zone of the reserve. The Village Sarainda Patti and Behri Ehatmali, the site of recent two attacks by Big Cat. 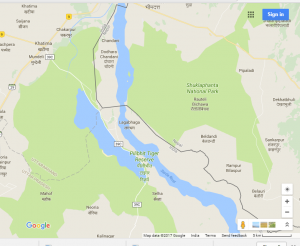 The green zone in google maps forms the boundary of Tiger reserve Pilibhit. Ineffective actions and remedial measures: Until now, only a combing operation was launched by using two elephants under the supervision of forest officer Adarsh Kumar but it appears futile, as the tiger has escaped. The minister in Central Government and a Member of Parliament from District Pilibhit, Mrs. Maneka Gandhi requested CM Yogi Adityanath to provide necessary resources required for the maintenance and security of Tiger reserves. 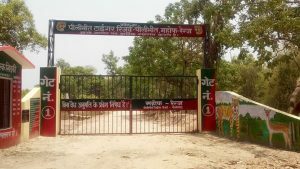 The ex-minister in Samajwadi Government, Mr. Hemraj Verma sat on an indefinite strike as a mark of agitation against the death of humans by tigers. The current infrastructure and techniques used by tiger reserves seem to be primitive for running a successful conservation plan of tigers. Even the banana countries of Africa monitored their national parks with choppers and satellites. Here officials are using hundred years old method of combing by elephants. An expert team is required to review the shift of tigress from reserve to the thickly populated zone of Amaria. Why forest official took a deaf ear on three years old shifting of a tigress to new settlement? More than two hundred seventy villages are located on the border of the buffer zone, how we are going to prevent the encroachment of both, tigers and human beings in their respective territories. These are some big questions need to be resolved in the backdrop of the havoc created by the tigers roaming like stray dogs in human habitation of Pilibhit. It is a high time to create awareness on environment conservation among masses. The unrelenting pressure on the big cats due to habitat loss compels them to compete for space with a densely populated human settlement. With efforts of National Tiger Conservation Authority, the project Tiger gave India a global distinction of having the maximum number of tigers in the World. As the 41st project of National Tiger conservation, the Pilibhit Tiger reserve needs more up gradation for creating a safe habitat for conserving national animal of India. The tragic deaths of the Nawal Kishore, Mohammad Tasleem, and Shamsur Rehman reflected the horrific impact of man versus wildlife conflict due to habitat loss, deforestation and lack of adequate resources for wildlife conservation. Pilibhit Tiger reserve was opened on November 19, 2016, for the tourist.